It was finally the weekend and I spent most of the day shooting with my friend Daniel because my job needed employee photos for their website. We always take really good photos together, we are like a dynamic duo here in Vegas. After shooting, we spent the rest of the day cruising around Vegas, had lunch, and just relaxed. I thought shooting was over till we decided to take photos of the actual outfit I wore that day which is certainly one of my favorites. My entire ensemble is from PinupGirlClothing.com and if you didn’t know, I am actually the Executive buyer of the website :). I was so excited to get my hands on this awesome Barbie cropped T-shirt that cost me only $25 and my FAVORITE Deadly Dames Capri’s in black in which I now have in every color lol. The pair was perfect and I was comfortable and chic feeling like a true Barbie in my Christian Louboutin open toe Maryl heels, Vintage Barbie hat box purse, vintage velvet cat eye sunglasses, and my bumper bang Barbie ponytail. I love when outfits are fun, easy, and comfortable. I could wear this outfit every day. I sometimes wear these cool outfits and forget to take photos so I am glad we got to shoot photos of this one ;). ← The Cat & The Caddy Shack! Looking lovely as always my Puerto Rican life size Barbie. Looove this look. It suits you perfectly. 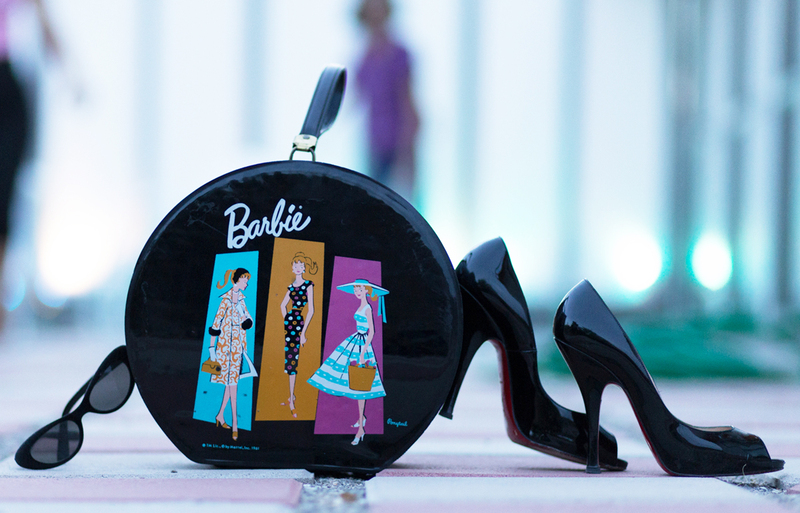 So fun to see you using the vintage Barbie case as a purse Jasmin! Fantastic Barbie-style photo session – I’m enchanted! Piękna sesja fotograficzna w stylu Barbie. Jestem zachwycona! Hi! I’m a doll collector and I really love your retro stylization in this photo session! You have beautiful Barbie’s shape 😉 Great photos! Going to purchase the pants asap. Jasmin turned into a Barbie I like that ! Perfect casual chic. You do take fabulous photo’s together. Lovely t-shirt! You look amazing! how and where can i buy this whole outfit? I’m wanting to recreate this look for halloween. Love the vintage element it brings in, just curious where you got your hat box purse from? I am seriously in love! I know where she got it!!! At my shop in in Boulder City, Back in Thyme Antiques. They are very hard to find though, especially in nice condition like this. I have only had one other in 15 years, and the zipper was stuck on it.